April is here! Holiday gatherings have brought many together to share time with their loved ones and to speak of a brighter future. Our young people in San Diego and across our country have “marched” to demonstrate their concerns and hopes for a safer nation. The national political scene remains chaotic and divisive…with little chance of that changing in the near future…And locally, Spring Break is over and our students are back to finish out the last few months of the schoolyear. Congratulations to the U.C. High’s boys’ division soccer champions. The JCC will once again be the location of the U.C. High music department’s “Sights and Sounds” production. This is a wonderful community event co- sponsored by UCCA and Costa Verde’s Regency Centers. We can now hear the familiar, “play ball” resounding through the P.A. system at Petco Park, and at our local ball parks. Vegetable and flower gardens are being planted and awaiting the long sun filled days to warm the soil. But not all is so wonderful in University City…The “Call to Action* “ explained below deserves your attention. A serious challenge faces us…the postponement of the City Water department’s plan to trench/tunnel a huge underground sewer line right through University City along our one and only north/south thoroughfare…Genesee/Nobel/Town Center Dr. UCCA/UCPG/UCCF have reviewed the plan and joined forces to oppose the current pipeline alignment, (NOT the concept or need for the PURE WATER Project), based on the realization that the planned route could have a very deleterious impact on our environment and traffic management. University City organizations are urging Councilperson Bry, other city council members, and the City Water officials to consider other feasible routes. Call to Action: Write, call, email your City Councilmember’s office to share your opinion with them. Please see the front page map of the print newsletter of the proposed pipeline and the accompanying article on page 1 and 3, which provides more detailed information as well as what YOU can do to support this community “Call to Action”. 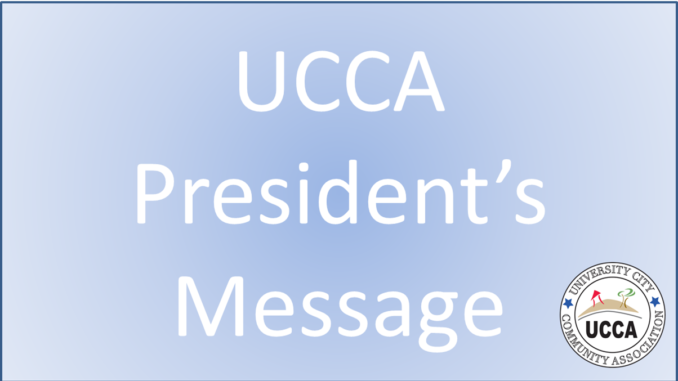 If you have forgotten, a reminder to JOIN UCCA for 2018 is always important…as UCCA’s efforts to maintain and improve the quality of life for all our families need your support. Remember, University City is “more than just a neighborhood”. Please plan to attend our April 11 meeting, starting at 6:00 PM at the UC Library, for an update on the Sewer pipeline. Thanks for your support. Notice of Public Hearing: On April 10, the San Diego City Council is scheduled to hear the case for approving the City’s Pure Water Project at 2:00 pm (Council Chambers, 12th Floor, 202 “C” Street). UCCA, UCPG, and UCCF have all voiced opposition, not to the project itself, but to the sewer pipe alignment along Genesee Ave/Town Center Drive. Those unable to attend the hearing may express support or opposition to this issue before the date of the hearing and decision by City Council. All communications will be forwarded to the Mayor and Council members.